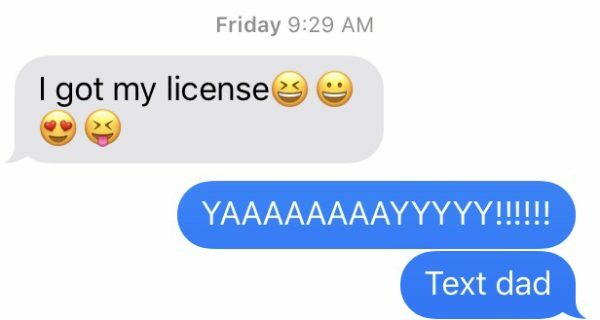 When your first born gets her driver's license: All the feels! That’s the text I got last week. My 17-year-old daughter was at the Motor Vehicle Commission, as they call it here in New Jersey, with her instructor (because that’s how it’s done these days I guess). She was under strict orders to let me know how it went ASAP. So, presumably not while actually still driving, she sent me this text. I had an immediate rush of pride and joy and then fear washed over me. My baby was going to drive! Legally! She would be out there with all those other drivers and her safety would be determined by whether they would do the right thing. And of course whether she would be ready for them to do the wrong thing. Scary. In the days following that, a sadness emerged. This is a very tangible sign that she’s growing up. Our years of raising children has been on the waning side for awhile: middle school, braces, puberty. Heck, (I can say hell now in front of them, but I still reserve swearing for times of extreme frustration and anger) one could argue childhood milestones are all about ending. You receive them as little bundles of need — the basic feeding dressing and diapering in the beginning, stretched into firsts like solid food or using the potty. They say that the teen years mirror the toddler years. The terrible twos are the terrible twelves and all that. What can I compare my daughter getting her license to? The idea of symmetry draws me to something that happened when she was about 7 — her first communion. In the eyes of our church, she was ready to participate fully in our worship. And now, in the eyes of the law, she’s allowed to participate fully in traffic. Seems a little hollow. Sure there was a pang at the time, but it was hard to see how far she would come in what seems like some playdates, class recitals, bra shopping and many mother-daughter teas. But watching her pull out of the driveway by herself for the first time, it was easy to see she was heading out, away and gone. Not today, of course. She only drove to band camp, and she called, sitting in the parked car, for instructions on how to operate the windshield wipers. But this is really the beginning of the end of her childhood. Standardized tests, college applications and the big move to campus seem uncomfortably close right now. *Yes, actually, I can wait. Does anybody have a pause button? Anything?